Kara and I recently threw ourselves an app party where between the two of us, we applied for 5 new credit cards! Thankfully, we were approved for all 5 credit cards and this app party netted us an easy 240,000 miles & points that we’ll be saving for our next big adventure. You’ll be hearing a lot more about this BIG adventure in the coming months. We were instantly approved for 4 of the 5. I had to make phone call to get approved for my Barclay Arrival Plus card, but I’ll talk more about that later. Between the five credit cards, we’re looking at a minimum spending requirement of $15,500 within the next 3 months. With the demise of the Target Red Card, this means lots of trips to Opry Mills (our nearest Simon’s Mall) to buy Visa gift cards. Our plan for manufactured spending hasn’t changed since our last app party. We’re still sticking to the Bluebird + Giftcard strategy out lined in this post. I’ll spend the rest of this post explaining which credit cards we applied for, and how they fit in to our points earning strategy. Side note: you should always have a strategy or plan for collecting miles and points before applying for new credit cards. This is one of the best/most flexible travel credit cards on the market. Since Kara has never applied for this card in the past, it was a no brainer. The Chase Sapphire Preferred card earns Ultimate Rewards points which are great because they’re transferable to 5 different airlines and 4 different hotel partners at a 1:1 ratio. Their most notable airline transfer partners include United and Southwest. Our plan is to transfer the Ultimate Reward points to United in order to build up our growing MileagePlus balance. We’re currently accumulating as many United miles as possible in preparation for our next BIG Adventure. Kara applied for this card right before their BIG devaluation. In case you haven’t heard, Club Carlson used to offer a free award night when you booked an award stay of 2 or more nights. That meant that if you stayed at one of their hotels for 2 nights using points, the second was free! This was a huge perk that allowed us to get a ton of value out of our Club Carlson points. We used the majority of our Club Carlson points on our Euroland trip last year. 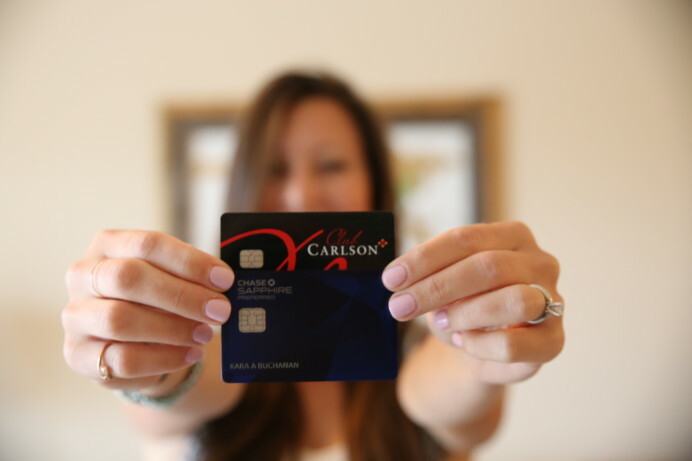 Kara applied for the card in order to replenish our Club Carlson points balance so that we could take advantage of the BOGO award night in our upcoming travels. Unfortunately, Club Carlson is taking away the free award night benefit this June ☹. I’m planning a trip for our Anniversary so we can burn these points while the free award night benefit is still available. Up until this point, I’ve been earning as many American Airline miles as possible. Unfortunately, I’ve about tapped out all of credit card options for earning more American Airline miles. For this reason I’m shifting my focus to United. As I mentioned before, Kara and I are banking United miles to save up for our next BIG adventure. This 55,000 point signup bonus will definite help! Additionally, having this credit card opens up more saver award space that “normal” people have access to when booking award flights. Theoretically, this means we’ll be able to have more flexibility and book cheaper award flight when redeeming all these United miles we’re earning. 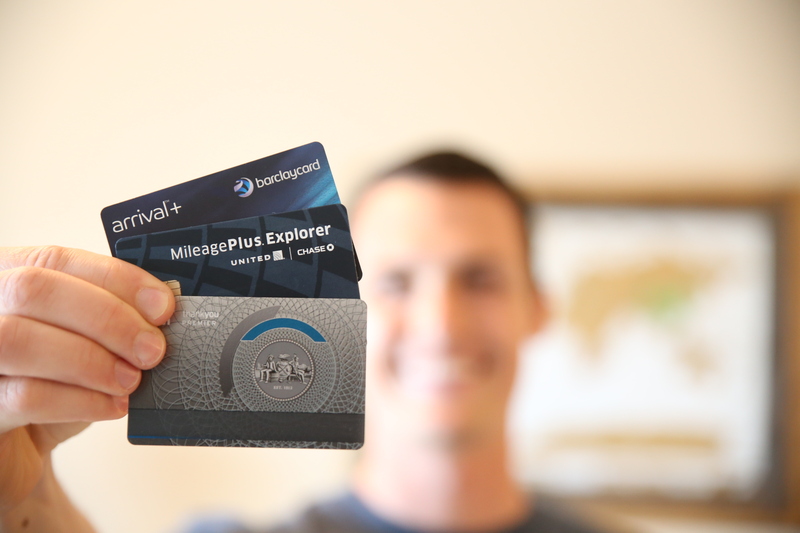 The Barclay Arrival Plus card is (in my opinion) the best fixed points earning credit card on the market. Kara applied for the card last year, and I was very pleased with how easy it was to redeem the points. We used the points Kara earned from her signup bonus to get free train rides across Europe during our Euroland trip. This card earns 2 points per dollar spent, and you can redeem the points to cover travel expense at 1:1 ratio; 1 point = $.01. During our next BIG adventure we’ll most likely be spending a lot time in hostels. If our average night at a hostel cost $40, then the sign up bonus alone on the card will get us 10 free nights (40,000 points = $400) worth of free travel! Hopefully, you’ve found it useful to learn how I decided exactly which credit cards to apply for during app parties. In my opinion, all five of the cards mentioned above offer fantastic value. I would highly recommend evaluating whether any of these cards fit into your miles and points earning strategy. If you have any questions, feel free to hit me up in the comments section below. If you’d like advice on which credit cards to apply for during your next app party, use the contact page to shoot me a message, and I’d be more than happy to help!